Nice catch of vermillion snappers caught on our drift fishing trip out of Fort Lauderdale. I haven’t done a fishing report in a while, but with the fishing as good as it is, I feel a fishing report is warranted. Our snapper fishing off Fort Lauderdale over the past few weeks has been nothing short of amazing. 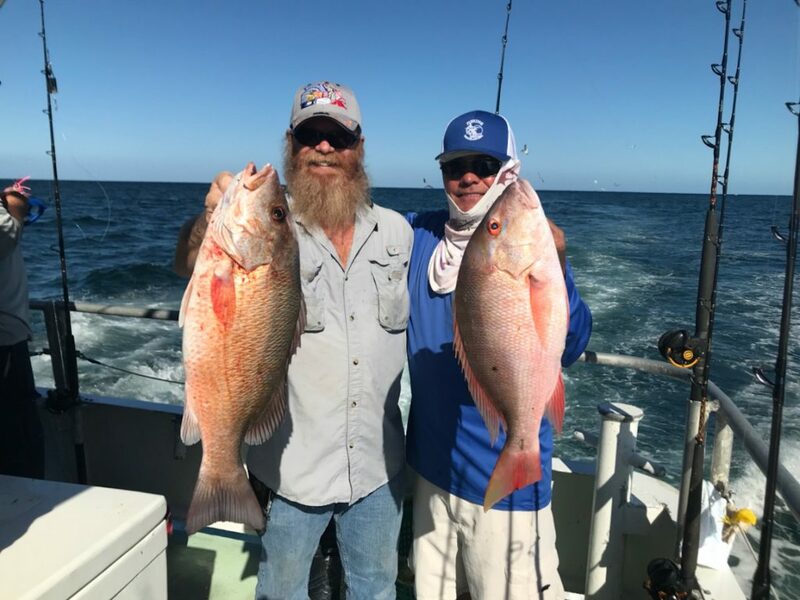 While the snapper fishing over the summer months was not as productive as in years past, the snapper fishing this year during October is well above expectations. 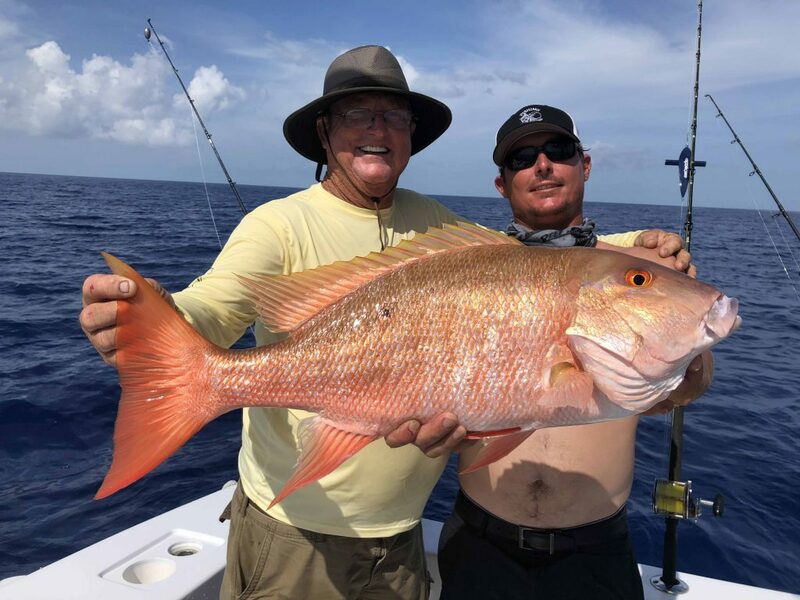 On our daytime drift fishing trips, we’re catching lots and lots of vermillion snappers, yelloweyes and some big mutton snappers mixed in. This is in addition to the regular catches of porgies, groupers, grunts, jacks and all the bottom fish species. An odd kingfish, tuna or cobia is also being caught on our daytime drift trips. Being off-season here in Ft Lauderdale, with everyone going back to school and getting into the swing of work/school stuff, we haven’t had the huge numbers of people on the trips as we normally do in the spring and summer months. This is a great thing for the drift boat trips because it gives you a lot more room to fish as well as a higher ratio of more fish per person aboard. This is a great season to come out and try some drift fishing. You’re almost guaranteed to get some nice snappers to bring home. Nice vermillion and yelloweye snapper caught by Andy on our drift fishing trip. Night fishing is just plain ole’ awesome this month. 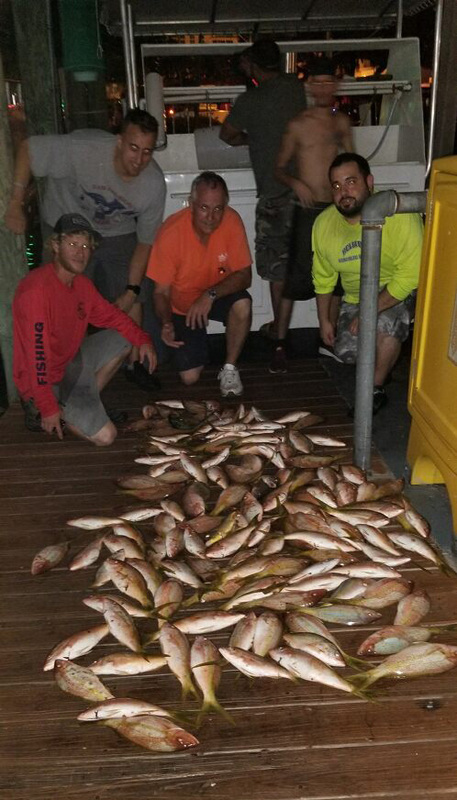 Snappers, snappers and more snappers are the catch on our night trips. The snapper species we target at night are the yellowtail snapper and the mangrove snappers. We do get a few of the bigger mutton snappers as well. But the sheer numbers of the yellowtail and mangroves that we’re catching at night is just incredible. This year has been better snapper fishing than I have seen in quite a few years. I love to see the bite so good because we have slow fishing sometimes in Fort Lauderdale, where it’s tough to catch anything. Fortunately for us, the bite has been really strong, so almost every trip is a good catch. We’re having nights where 3 deckhands have to clean fish for over an hour after the trip because we caught so many. Night anchor trips are also yielding a some sharks, cobia, bluefish and barracuda too. Big pile of yellowtail snappers after a night anchor trip aboard the Catch My Drift this week. Sportfishing boats are getting their fair share of fish out there. 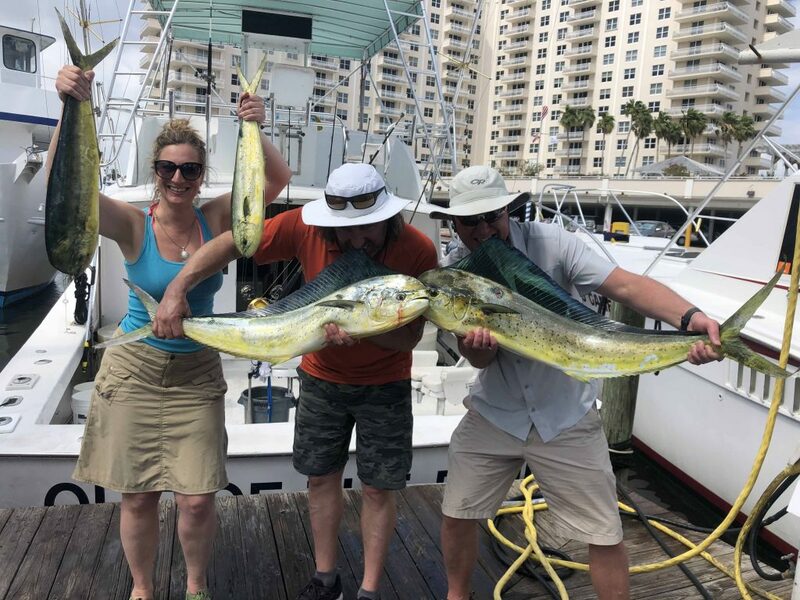 Some good catches of mahi-mahi (a few really big ones), wahoo, tuna, kingfish and some of the big game fish around the wrecks. It’s a mixed bag for the sportfishing boats this time of year, they can catch just about anything. 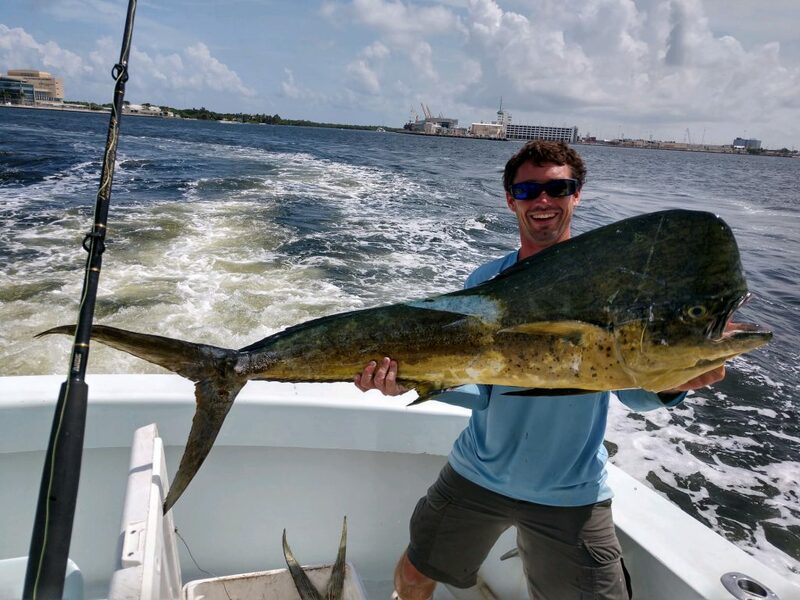 Mahi-mahi are funny in that they come through really strong for 2-3 days in a row, and then they disappear for a week or more where there are none to be found, and then they pop up again practically jumping in the boat. It’s very hit or miss with the mahi-mahi or as I like to say, “Hero or Zero”. 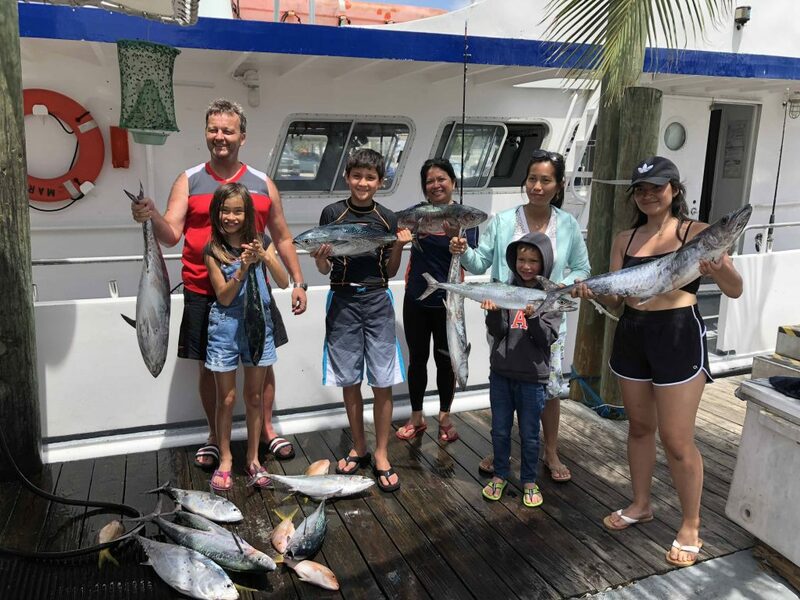 Still, even on the days when the mahi-mahi are non-existent, the tunas, kingfish and other reef species are keeping us busy reeling in some nice fish. Nice snappers caught on the drift fishing trip out of Fort Lauderdale. 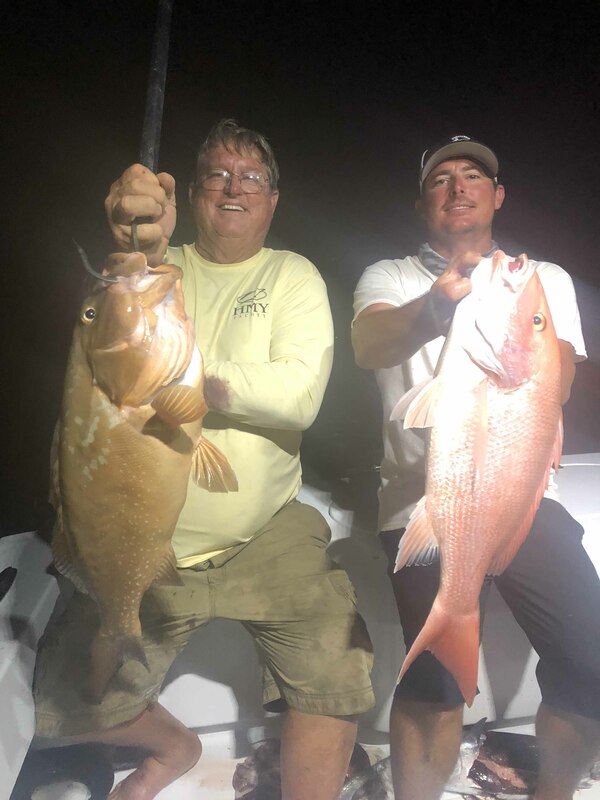 If the bite on the troll slows down, we usually switch over to deep dropping over the shipwrecks to try to hook into a big amberjack or grouper. There are some big groupers still lurking around the wrecks and deep dropping is fast paced fishing. You drop down, and either get a bite in the first 2-3 minutes or you reel them in and try to hit another wreck. It usually only takes a couple shipwrecks before you find a wreck that is holding some fish. Fish move from wreck to wreck every day so you have to experiment a little with some trial and error to find where they are biting that day. And if the big game fish aren’t biting on the wrecks, we can always drop some multiple-hook chicken rigs to load up on the vermillion and yelloweye snappers. It’s a buffet out there these days. Nice bull dolphin caught on our sportfishing charter out of Fort Lauderdale. The secret to fishing in Fort Lauderdale in October is to stay versatile. You need to switch from technique to technique until you find what’s working that day. That’s one big reason the afternoon is often the better trip time. We have all that trial and error from the morning figured out so we can go right to what was working for us the best immediately when we go back out for the afternoon run. 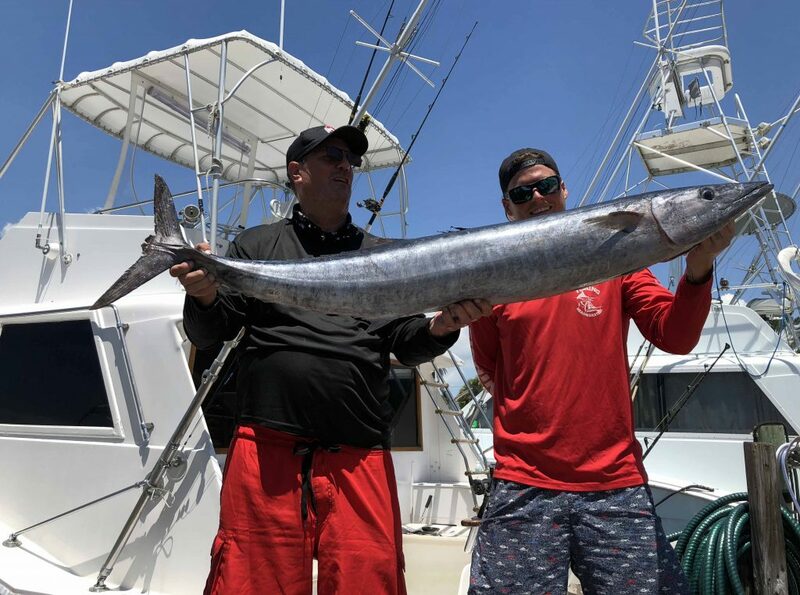 The mullet run is just getting started which rejuvenates the reefs with lots of available food (baitfish) and get the big game fish such as sailfish, sharks, tarpon and barracudas, snapping all over the reefs. Good luck to everyone fishing in these coming weeks. I’ll sea ya on the water! Nice wahoo caught on our sport fishing charter out of Fort Lauderdale. The fishing in April is great… and so is the catching! We’re catching a variety of fish this week on both our drift fishing and our sportfishing charters. First off, on our drift boat we’re catching quite a few yellowtail, mangrove and mutton snappers. These are our main target and they are biting good for us on the third reef in about 80ft of water. On days when the current is strong, the fish move in shallower so they don’t have to expend so much energy to hold position, so we move in shallower too. Day trips are catching a nice mix of snappers along with grunts, porgies, triggerfish and some groupers. Groupers are biting pretty decent out there, but I don’t mention them much because they are out of season and have to be released regardless of size. On May 1, the grouper season opens and we’ll be sure to target them much more once we can keep them. For the anglers fishing the drift boat trips looking for larger fish, the kingfish and bonitos are biting decently. 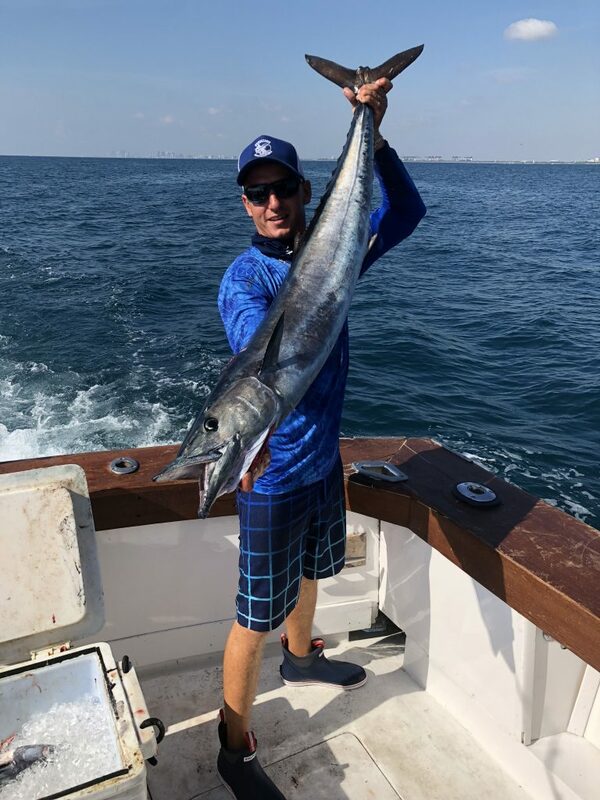 You always get more action fishing the bottom baits, but if you want to go for something larger, fish a whole sardine or ballyhoo on a mid-depth rig and you might get lucky with a nice kingfish, bonito, tuna or cobia. All of those species are out there on the reefs right now. 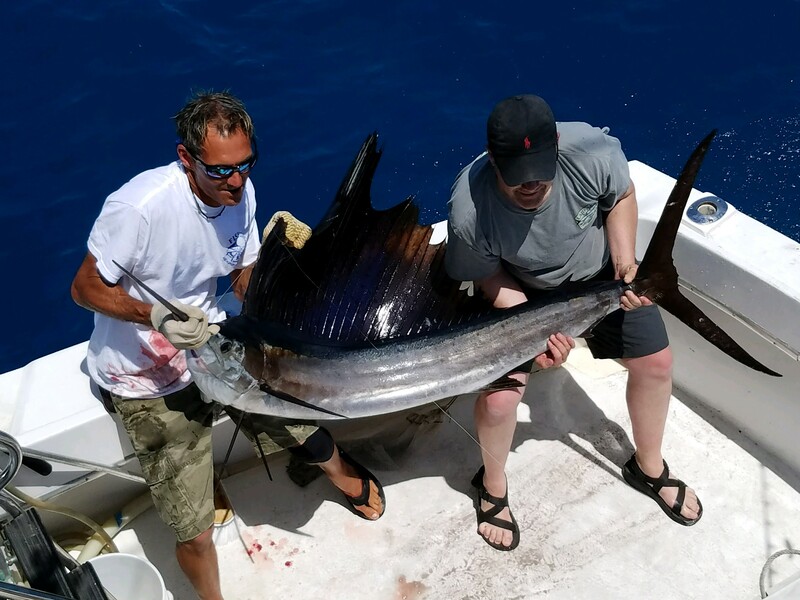 Nice sailfish caught on our deep sea fishing trip in Fort Lauderdale. Our sportfishing charters really shine this month. April is the mahi-mahi spawn where the fish come right in on the reefs in only 100-150 ft of water to get their spawn on. Any day when we get a strong East wind is a good day for mahi-mahi dolphin fish. Coincidentally, the strong East wind days are also the roughest days to fish out there, but it’s worth it. The big waves create action on the top of the water, and as a rule, activity generates more activity. It’s a great cycle and it really gets the fish hungry and aggressive. April is famous for big dolphin, right in on the reefs. Along with dolphin, we also get a lot of other cool gamefish such as wahoo, tuna, sailfish and sharks; activity generates activity. 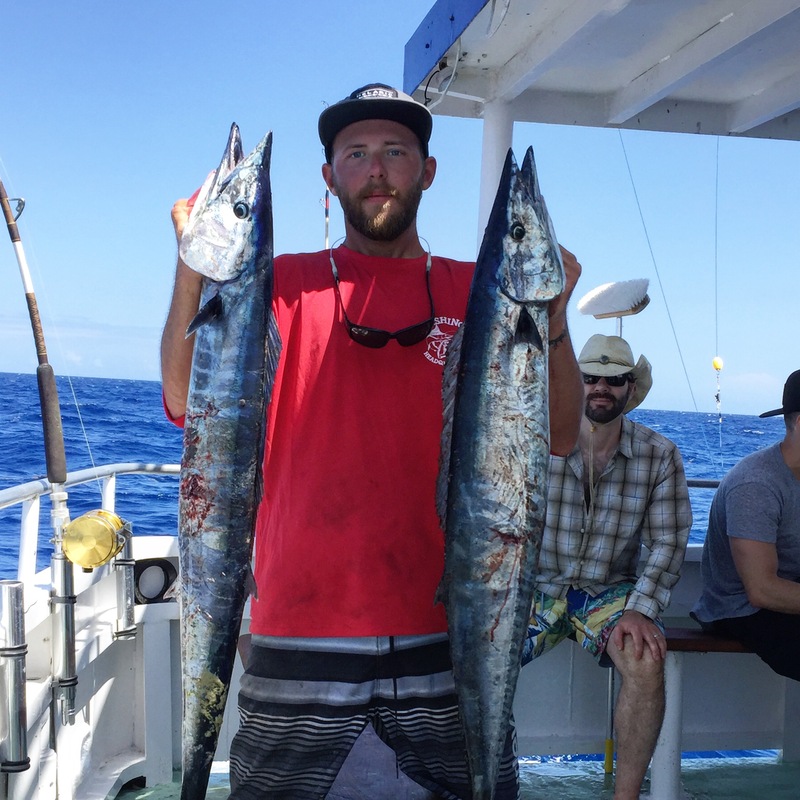 11 wahoo and some mahi-mahi caught by this bachelor party fishing charter. 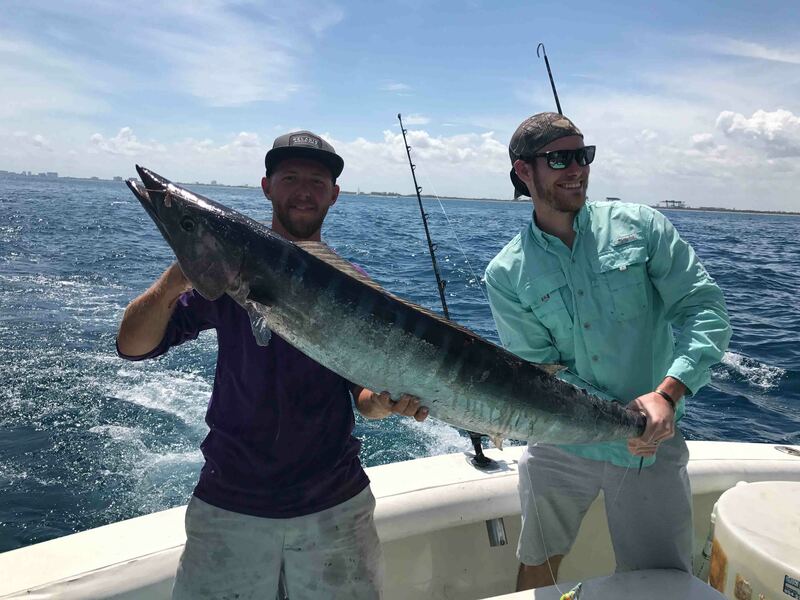 We had some off-the-scale Ft Lauderdale wahoo fishing this past week. We run a lot of bachelor party fishing trips on our boat the Mary B III, which is set up to take out larger groups on sportfishing charters. This group had 13 guys and they did a half day fishing charter with us on the Mary B III. From the second we first put our lines in the water until it was time to head back, we caught wahoo after wahoo after wahoo. 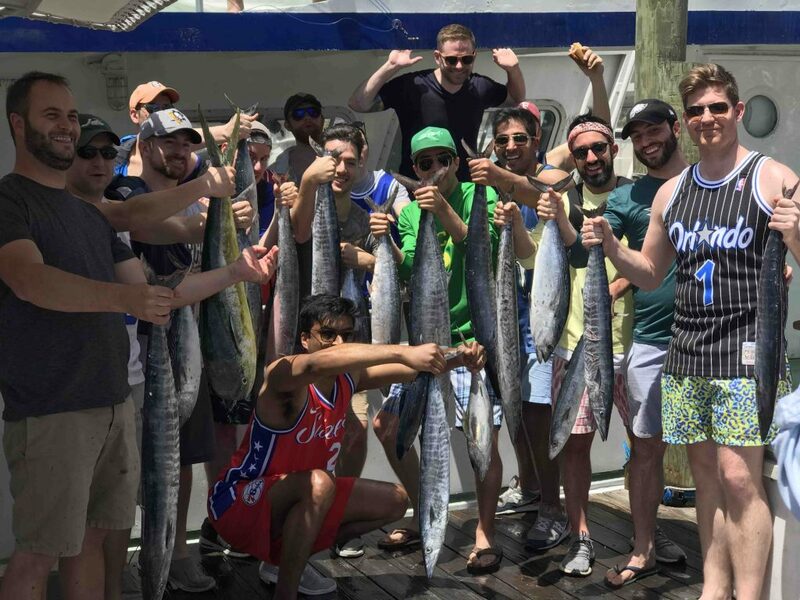 It was an incredible trip and we caught a total of 11 wahoo, plus a few mahi-mahi and tuna. Fishing trips that good are few and far between. 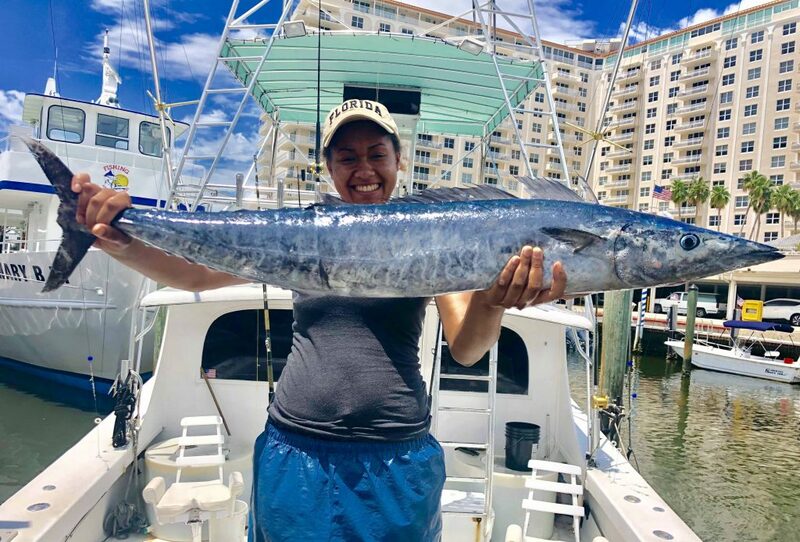 Nice wahoo caught trolling off Fort Lauderdale by this lucky angler. This wasn’t the only trip we’ve caught wahoo on this week. 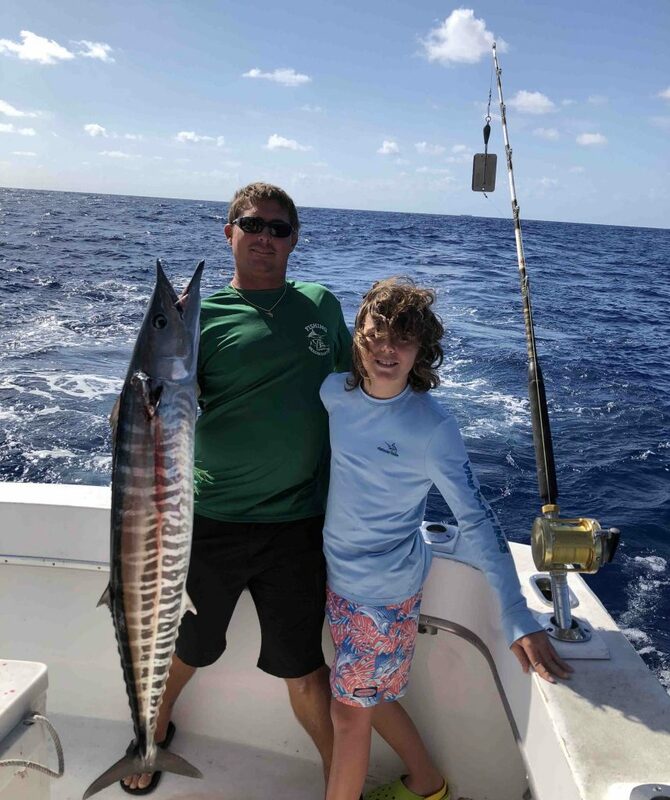 Capt Paul caught a 70 pound wahoo a few days ago on a lucky bite while pulling live bonitos around, as well as another trip a day later when he caught 4 good size wahoos. The wahoo fishing lately has been the best I think I have ever seen. Either that or we’re just getting really, really good at it. April is the top month to fish Fort Lauderdale. Just about everything is biting this month and we catch some of the biggest fish of each species that we will all year long. May is really good too, but don’t wait to fish. Come fishing now if you can while the fishing is good. Good luck to everyone fishing out there this month. I’ll sea ya on the water! Nice mangrove and mutton snapper caught by these lucky anglers on our drift fishing trip.